I tend to stick to the same skincare routine year-round, but lately I've felt that my complexion looks a little lackluster. I can almost feel the dry winter air sucking all the moisture out of my skin. It has taken a few weeks to get my new routine down, but I've found a few products that I already love. 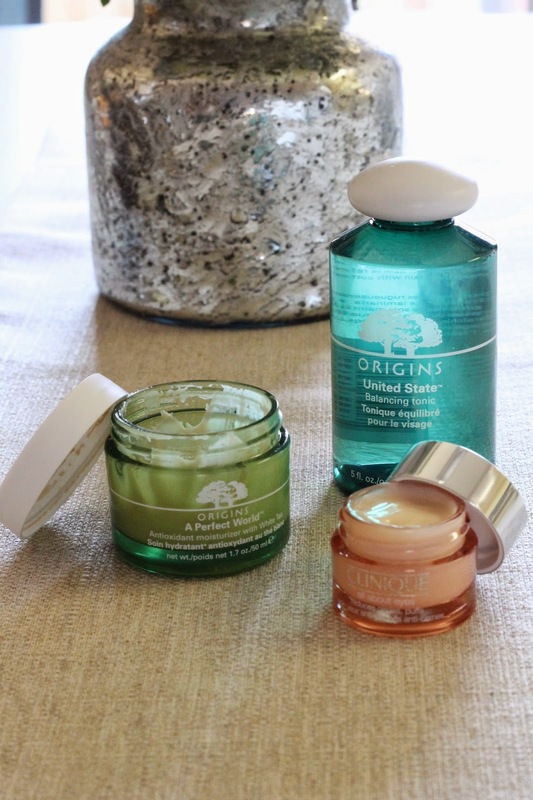 Origins: A Perfect World Moisturizer Flaky patches do not stand a chance with this rich moisturizer. It is thick without being greasy and feels light on my skin. It has a mixture of white tea and vitamin C which protect against daily elements like smog and stress, plus a lovely light scent. I apply this at night before bed, but it also comes with SPF if you need a moisturizer for daytime wear. Origins: Balancing Tonic I've read about this toner for years. It has gained a cult following, and now I understand why. It is great for those with combination skin who still suffer the occasional acne spot (so annoying) because it de-clogs pores without stripping your skin. After applying my skin feels tight, but not dry. I use it twice a day. CLINIQUE: All About Eyes Over the last few years I've started to notice a few fine lines creeping in under my eyes. This eye cream light enough to layer on, doesn't run in my eyes, and doesn't break the bank. All major winners in my beauty cabinet.